Oddly-shaped ridges located adjacent to Pluto’s Sputnik Planitia were created by ancient nitrogen ice glaciers, according to a group of scientists led by the SETI Institute‘s Oliver White. Two types of ridges are positioned next to Sputnik Planitia, the basin that constitutes the western half of Pluto’s heart-shaped feature known as Tombaugh Regio. Flat regions such as basins and valley floors contain “washboard” ridges while steeper areas, such as crater walls, have “fluted” ridges. Both types of ridges connect to an apparent tectonic system at Sputnik Planitia’s edge. Using images captured by NASA’s New Horizons mission when it flew by Pluto in July 2015, White and his team mapped the ridges’ shapes, dimensions, and distributions in an effort to uncover their origin. Based on the ages of crater surfaces, the researchers determined the strange ridges formed approximately four billion years ago, after the giant impact believed to have created Sputnik Planitia. 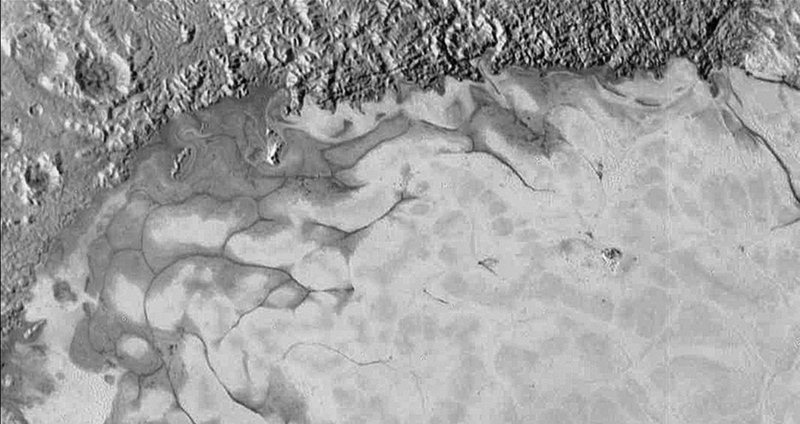 Computer models of the behavior of volatiles on Pluto indicated these low-elevation areas likely held nitrogen ice glaciers, which subsequently migrated into Sputnik Planitia over time. Water ice stayed afloat at the tops of pits that contained nitrogen ice from these glaciers. Over tens of millions of years, the nitrogen ice sublimated into gas while the water ice remained behind in the form of the ridges. Using the spacing of the ridges, the researchers created very precise maps of the glaciation coverage four billion years ago. Findings of the study have been published in the journal Nature Astronomy.